PTAS seeks to work with its suppliers, customers and research organisations in strategic partnerships to develop new technologies, new products and applications in electrical control engineering. 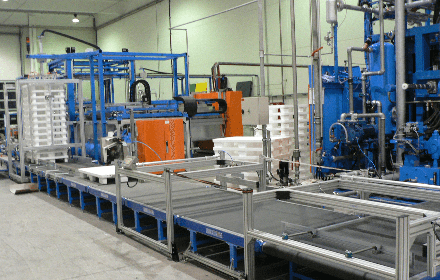 Hirsh (Austria) – Vacuum forming pallet making line. Between 2001 – 2009 PTAS worked with a local innovator who was seeking experienced controls input into the development of a process, and machinery, to manufacture a styrene foam laminate pallet. PTAS applied its manufacturing knowledge and experience to research and develop a control system to support the technologies being applied to this innovative concept. Once tested the entire plant was exported to Austria and commissioned. Working with NHP, PTAS undertook the detailed design, manufacture and a 26m prefabricated switchroom containing HV, LV and controls for Boyne Aluminium smelter. PTAS is a long-term NHP/CUBIC partner. The switchroom was built, fitted out with all of the LV protection, motor starters, VSDs, distribution boards, ControlLogix ® PLC platform at PTAS, then tested prior to road transport to Gladstone, QLD for commissioning.